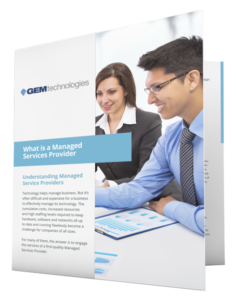 GEM Technologies removes the drain and worry from managing and maintaining your IT infrastructure so you can focus on what you do best – growing your business. Our managed IT services in NYC do more than provide you with an extra set of hands — we deliver 24×7 assistance, impartial assessments, practical solutions, years of expertise and peace of mind. As your Managed Service Provider in NYC, we take a proactive approach to your company’s IT needs. GEM Technologies proactively monitors and maintains your network, servers and other vital systems to prevent minor issues from becoming major headaches. This means you have more time and manpower to focus on strategic goals — with less overhead.